The running back and quarterback ran for the same track club as kids, played for the same high school football team and now have chances to shine together in the Bruins’ backfield. The apple doesn’t run far from the tree. Running back Paul Perkins and quarterback Brett Hundley, UCLA’s All-Chandler (Ariz.) High backfield, disagree about one thing: Who’s faster. They met as children, not far removed from midday naps, while running for the Arizona Cheetahs Track Club. “I was faster,” Hundley says. “I can still put up a race,” Hundley says. A stern fatherly hand might be needed. Except Paul “Bruce” Perkins and Brett Hundley Sr. have their own tongue-in-cheek issues. Both were running backs, Perkins at Arizona State and Hundley at Arizona. From father to son to Chandler to the Bruins’ backfield, Perkins and Hundley are all but joined at the hip, and thoroughly enjoy giving each other lip. They even share a UCLA dorm suite. When UCLA plays football against California on Saturday night, Perkins will move in behind Hundley, replacing the injured Jordon James. “We’re friends back there, calming each other down when things are going south, mellowing each other out,” Perkins says. Perkins was effective as a backup to James, offering the Bruins a different look. “I don’t want to say we’re a finesse offense, but we’re such a space-orientated offense it’s nice to have a guy who will put his pads down and be physical,” offensive coordinator Noel Mazzone says of Perkins. James was the nation’s fifth-leading rusher through three games, then suffered an ankle injury against Utah. Perkins carried a heavy load in the second half. Perkins, a redshirt freshman, gained 92 yards, 36 coming on a fourth-quarter field-goal drive that broke a 24-24 tie. So who’s faster is irrelevant, to both generations. “Don’t ask us to race; we might blow out our hamstrings,” Perkins’ father says. The two families have been close since the Cheetahs. “They were the two youngest on the team, so they identified with each other,” says Ore Perkins, Paul’s mother. “Brett is fast, Paul is very fast,” she says. The families tailgate together at UCLA games, ignoring their past Arizona State-Arizona rivalry. And they check in with each other’s son. The Cheetahs had both kids on the fast track to Chandler. Perkins joined Hundley on the varsity as a sophomore — as a defensive back. Running back, though, was in his DNA. Don Perkins, his uncle, was a Dallas Cowboys’ fullback. Don was the NFL’s rookie of the year in 1961 and played in six Pro Bowl games. Bruce Perkins played with Tampa Bay and Indianapolis in the NFL. Perkins joined the family business as a junior, when an injury left a hole in Chandler’s backfield. He gained 270 yards in six games. Hundley led the team with 856 yards rushing. The next year, Perkins gained 1,297 yards and scored 20 touchdowns. Hundley was quarterback-in-waiting at UCLA by then. His father made sure Rick Neuheisel, then UCLA’s coach, had Perkins’ highlight tape. “I gave it to him on a Saturday and they offered Paul a scholarship on Monday,” the elder Hundley says. A Chandler connection was established. “Yeah, they’re our triple-A team,” Mazzone jokes. It may be more than a gag. Chandler receiver Dionte Sykes has committed to UCLA. Quarterback Bryce Perkins, Paul’s brother, has been offered a scholarship by UCLA. 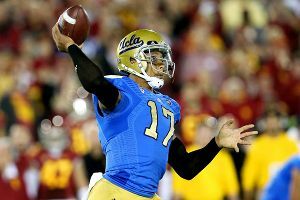 Since his sophomore year of high school (Chandler High School), UCLA quarterback Brett Hundley has engaged in a symbolic ritual. Just before the first whistle of preseason football practices, he stows his trophies, awards and press clippings away from sight. “I’d take a big box and throw them in there and put them in a closet,” he said. It’s a gesture that reinforces for him an athletic truth. The past, however wonderful, means nothing in relation to the present moment and how that present prepares you for the future. QB Brett Hundley passed up being a likely first-round pick in the NFL draft to return to UCLA. New among the baubles he will be hiding away this summer are 2014 NFL draft projections, most of which envisioned him not lasting terribly far into the first round. Unlike past trophies that just sit on a shelf looking shiny, the NFL draft would offer present impact that would keep on giving, something like, for example, the $5-million signing bonus former Florida State QB E.J. Manuel received as the No. 16 overall selection last year. But Hundley opted to pass up the draft and return to UCLA for his redshirt junior year. By doing so, he’s established the Bruins as a preseason top-10 team, a Pac-12 and national contender and himself as a legitimate Heisman Trophy candidate. So while fulfilling his NFL dream was tempting — something he readily admits — he has no regrets, even if he can barely walk after brutal winter conditioning drills this week. Not unlike Hundley, the UCLA program also has been receiving plenty of pats on the back of late. It’s won 19 games in Jim Mora’s first two seasons, and this fall’s 10-3 campaign, which included a second consecutive win over arch-rival USC and a final No. 16 ranking, has inspired many early 2014 projections to rank the Bruins in the preseason top 10. Hundley liked how the Bruins again beat the Trojans and finished with a strong performance in a Sun Bowl win over Virginia Tech, but his ultimate take on the season — not unlike Mora’s — wouldn’t be described as euphoric. That last phrase about the Sun Bowl is meaningful. Hundley knows two years ago multiple USC players took shots at El Paso and the Sun Bowl and then turned in perhaps the worst bowl performance in program history. Bruins players were surely brought up to speed on that during their bowl preparations, and Hundley has retained that PR lesson even a month later. Hundley is both media-aware and media-friendly. He’s an engaged and engaging interview. And he pays attention to what he’s saying. The reason all that is important is he’s about to become the most famous football player in a quaint town called “Los Angeles.” The spotlight will burn bright, particularly if the Bruins get off to a fast and winning start. A date with Texas in AT&T Stadium in Arlington on Sept. 13 looms large, an early marque nonconference game of national interest that could announce Hundley as a top Heisman candidate. As for the potential upcoming media onslaught, Hundley seems both grateful for it and unmoved by it. Hundley passed for 3,071 yards and 24 touchdowns last year, with his 67 percent completion percentage ranking first in the Pac-12. He also rushed for 748 yards with 11 touchdowns, averaging 4.7 yards per tote, despite getting sacked 36 times. He ranked second in the Pac-12 and seventh in the nation in ESPN Stats & Information’s Total QBR. At 6-foot-3, 223 pounds, he’s a physical specimen with A-list athletic ability. When asked where he most needs to improve, he starts with “everything” but moves on to the nuances of being a quarterback, dropping the names Peyton Manning and Tom Brady. Yes, Hundley is goosed about the Bruins’ potential in 2014 and he doesn’t mind showing it. But in about six months all the trinkets and baubles and effervescent preseason media evaluations will be packed away in a dark closet. Because what you did last year and gushing preseason hype won’t gain a team an inch on the football field.